Toyokalon hair and advice graciously provided by Doctored Locks Hair Extension Store. Carries everything from the new Micro-rings extension system to bulk Jumbo braid hair. Dr. Locks is a friendly person to deal with, has excellent customer skills and super fast shipping service. It took me three days to get my order of hair, and I’m Canadian! Not all of us have the perfect hair for portraying the character we desire, especially if the hair of the character is waist length or longer, like Galadriel or Eowyn. Below I will detail some helpful tips and methods on creating hair pieces with synthetic or human hair, as well as available options regarding tracks, weaves and wigs. Both have their advantages and disadvantages. Synthetic hair is essentially plastic that is processed and treated to look like hair. It can come in a variety of packaging or types, as well as a variety of colours to help match to your own hair. Synthetic hair has the advantage of begin easy to care for if you know the proper techniques. Because the hair is essentially refined plastic, the colour will never wash or fade out and the style that it comes in will retain its shape if stored carefully. The disadvantage to synthetic hair is that, it being plastic, it is suceptable to heat. You cannot use heat appliances such and blow dryers, curling irons, crimpers or curling sets on it because it will melt the hair, giving you one lump, snarled mess. Human hair, is exactly as the name implies; High grade and quality human hair. All of it is chemically processed to keep it from being bug free and is disinfected, as well as chemically processed to style it properly and keep it soft. You can wash this type of hair as you would your own hair, as well as style it using blow dryers, curling irons, crimpers or curling sets. The disadvantage to human hair is that if it is dyed “unnatural” colours like green or blue, the colour will eventually fade over time and just like hair on your head, the ends are prone to breakage and splitting due to dryness. Loose/ bulk: Packaged hair in bundles used for loose extensions. Track/Weave: Hair sewn together and attached to corn rows on your own head. Wigs: Total hair coverage, Wigs are available in a variety of styles and lengths. Jumbo Braid: Not very good for loose extensions or falls because of the poor quality. Best for making dread-locks. Yaki: Better quality bulk hair. Yaki or Yaky is used for base colour in synthetic hair pieces. Silky Yaki: Excellent quality hair. Usually used for accents or highlights, though can be used for whole hair pieces. Toyokalon: Excellent quality hair. The difference between toyokalon and silky yaki is that toyokalon curls at the end, where silky yaki is poker straight. It is a bit fuller and more natural looking than silky yaki. So, now that you have the basics of hair extensions, you’re thinking how do you attach them to your own head? Permanent Extensions: Usually braided into your own hair. This is especially useful if your hair is shorter than an inch and a half. Hair Falls: Temporary Hair pieces created by bundling loose hair together into pony tail attachments and attaching them to pony tails or buns on top of your own head. Wig creations: Using a wig as a base design, you can add synthetic or human hair to give it more fullness, length or style depending on what you need. Wigs are also temporary. It is generally recomended that the base hair type of the wig should dictate what hair type to use. IE: If your wig is synthetic hair, use synthetic hair attachments on it. Useful if your hair is too short to braid, or you want to change your look completely. (IE: Go from a dark auburn brunette to a platinum blond.) For the ease of costuming, many people prefer wigs. The problem with wigs is that you should make the attempt to find a good quality wig. Wigs sold in party stores or halloween novelty stores are not (or rarely are anyways) good quality hair that will last. Working with loose hair can be a time consuming process, but the rewards can be well worth the effort. I created my synthetic hair piece by using four bags of toyokalon grade hair in three different colours (Black, dark brown and golden brown), four hair combs (Two large, two medium sized) and a wire headband. It took me four days to attach all the hair I needed to the pieces, but the look I achieved was well worth the time. At the time these pictures were taken, my hair was only chin length. 1. AT LEAST Four bags of Synthetic hair in Toyokalon quality, in as many colours as you wish. 3. Hair combs. Goody Brand makes several different sizes which are available at any drug store. 4. Hot glue gun and glue sticks. 2. Pull the end of the hair through the loop so that it creates a knot at the top and use the hot glue gun to glue it in place. You don’t need too much, just a small bubble. 3. Continue this process until you feel you have enough of that colour, then repeat the process with a different colour until the head band is covered. 4. Do the same process as detailed above with the combs. After the glue has dried and you’ve brushed your hair out (Doing this during the making process with help keep the snarls and tangles at bay), inserting the hair piece is easy. 1. After washing your hair, use some mega to super hold gel (I used L’Oreal’s Special FX Studio Radical hair gel) and distribute it through your hair. 2. Section your hair from ear to ear, pulling the forward hair pile into a scrunchie or hair elastic. 3. Braid the loose hair at the back into three lace braids or a french braid if possible. 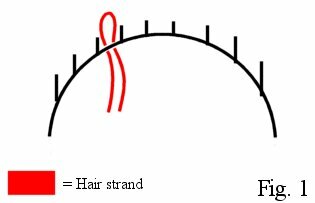 If your hair is long (chin length or longer, you may have to tuck the ends of the braids together and fold them under. Secure with elastics. 4. Place the two larger comb hair pieces in the middle back, making sure the “teeth” are through the braids to help secure them better. Secure with bobby pins or elastics if needed. 5. Place the wire head band hair peice along the part you’ve created from brushing your hair forward, making sure the wire “teeth” stick into the braids to hold it in place. 6. Pull the forward hair out of the scrunchie and brush back, securing as needed with bobby pins, hair clips or elastics to hide the headband as best you can. *NB: I herringbone braided three braids in the head band hair piece and secured my front hair to those with elastics, this not only helped keep the headband in place, but also kept my “forward” hair in place as well. 7. Add little bits as needed, like hair jewelry, tiaras or circlets. I use an inspired replica of Arwen’s Head-dress from the Bridge Scene to keep stray bits from falling out. I used this method and my hair piece stayed in with minimal fuss and muss for about 8 hours, but because of the weight and me being unused to having that much hair, I began to develop a headache around the 8 hour mark. To remove the hair piece, just reverse the process. 1. NEVER take any heat appliance to your syntheic hair pieces for styling purposes. This will melt the hair and cause one HUGE snarly mess. 2. To add shine and preserve the ends of the synthetic hair, use a Silicone Wig Spray or Latex Spray applied to hair. 3. Store in a plastic bag, loosely coiled to keep the ends and shape of your hair piece. 4. Over time the ends may get a bit frayed. To smooth them out again, use a hair dryer on the LOWEST setting and brush through while appling the head. Do so quickly and remember to keep brushing, lest ye end up with a tangled, melted mess. 5. Use a large paddle brush to brush out your hair piece. Any large knots you can use a bit of spray Leave In conditioner to help loosen the knot and brush it out. Smaller knots need to be cut out. 6. If your hair piece begins to smell slightly, you can use Febreze to help lessen the smell, or swirl your hair peice in a diluted mixture of wig shampoo or laundry detergent, rinse well and let AIR DRY. 7. Do not brush your hair piece hair when it is wet. Allow it to air dry before taking a brush to it. Using braiding techniques from dreamweaverbraiding.com, here is a classic elegant look that can go from the Elvish Courts of Lothlorien to the Halls of Edoras in Rohan. 4. Ribbons, fabric roses or any other assorted hair adornment goodies. 2. Place the Head band Hair Piece in the center of the dutch braids as close as you can get it. Sometimes it helps to have a wider base to work with. 3. From the hair piece, put a braid on either side of your head at the highest point on the head band. You may also want to do this BEFORE you put in the hair peice, so that you can see if you’ve covered the glue portion of the Head Piece. 4. As per the instructions for the Classic, using one of the braids from step 3, twist the braid into a bun and secure at the back just above the hair piece with bobby pins. Take the other braid and twist around the bun and secure with a bobby pin. This should cover some of the head band. 5. You’re done! Add a ribbon and thread it through your hair if you like, or add some mini roses that you can find in craft stores for relatively cheap to your hair. You may also wish to trim off the ends of your headband. Get someone to help you with this, as it may require the use of a Dremel Tool. Any extra loose hair of your own can be tucked into a bun underneath the hair piece to add extra support if needed, and you can always add an elastic to the base of your hair to add extra support as well. This SHOULD stay in place for a while, because the teeth of the headband are anchored into the dutch braids on your head. 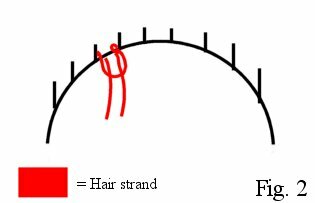 When braiding your hair, it is best to do it while dry. Wet hair expands and can cause constriction on your scalp. Not only can this cause trauma to your scalp in the form of hair loss, but it can leave you with a nasty headache! 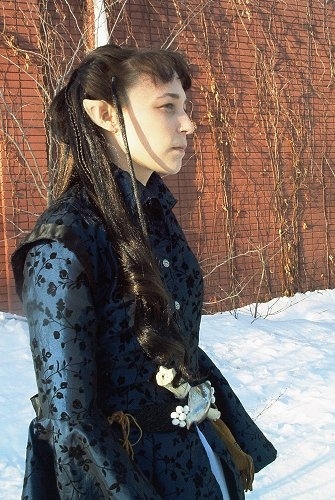 For a more Rohirrim Style, use Green or Dark Blue satin ribbon and weave it into the braid. For an elvish touch, try adding a single white silk flower with a light dusting of silver glitter places in the center top of the bun at the back, with a very small tendril of ivy. For a Minas Tirith maiden, try pinning a sheer veil in a dusty grey to the bun or the braids at the temples.